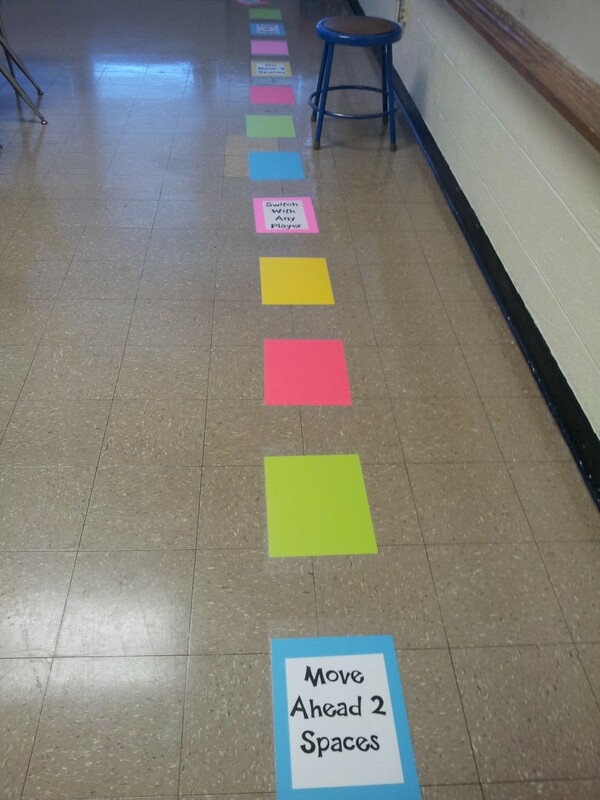 This is a great way to get the kids motivated for review! This new addition is sure to get rave results! I can’t wait to show the kiddos tomorrow. It took about 2 hours to complete it, and it actually wraps around 3 of the 4 walls of my classroom. Once you have all the spaces laid out where you want them, use clear contact sheets to stick them down and act like page protectors from all those vigorus feet. I’m not sure how this would work on carpet. I have tile flooring in my room. If you don’t want to stick the spaces to your floor indefinitely, you can just lay down the spaces each time you want to play the game. To play, ask your kids to line up (you can roll to see who goes first). Oh yeah! Don’t forget to get a big die! An inflatable one would be fun… Ask the first player a review question (you could use test questions, vocabulary, multiplication facts, and the list goes on). If she gets it right, she gets to roll the die and follow the instructions (if there are any) on the space. The first one to get to the finish space wins. You can always add fun things for the kids to do on those blank spaces, but I didn’t because I really wanted to focus on the review-factor of the game. Plus, the kidss can always cut up during ZAP! *Update: We discovered this works better for a smaller class size. 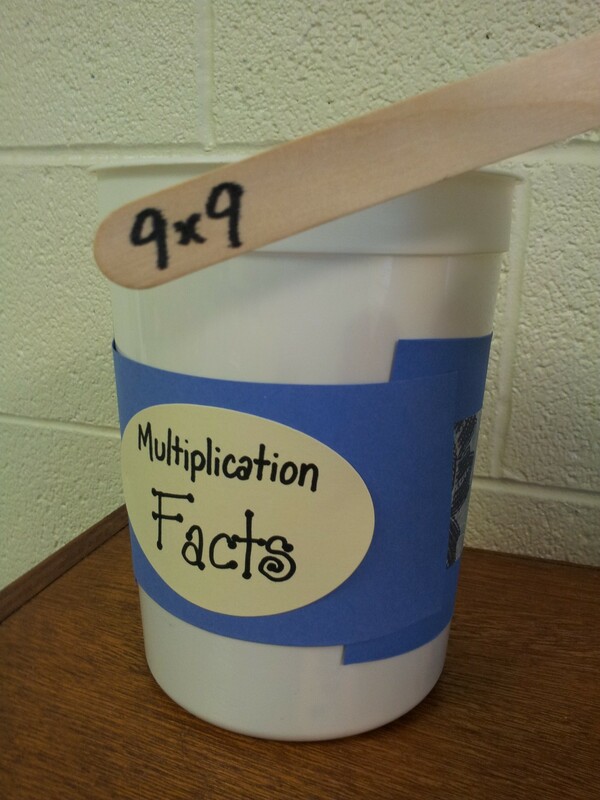 I’ve only got 4 kids in my math class, so it was perfect for reviewing multiplication facts! On the flip-side, we tried it in my science class (which has 10 students), and we found that there was too much waiting in between each round of turns. The larger class sizes seem to benefit from team games, like ZAP! Never ask the same problem twice again! I’m in the process of designing a new game. I think it’ll be a long the lines of… Candyland. That’s all I’m going to say on it. 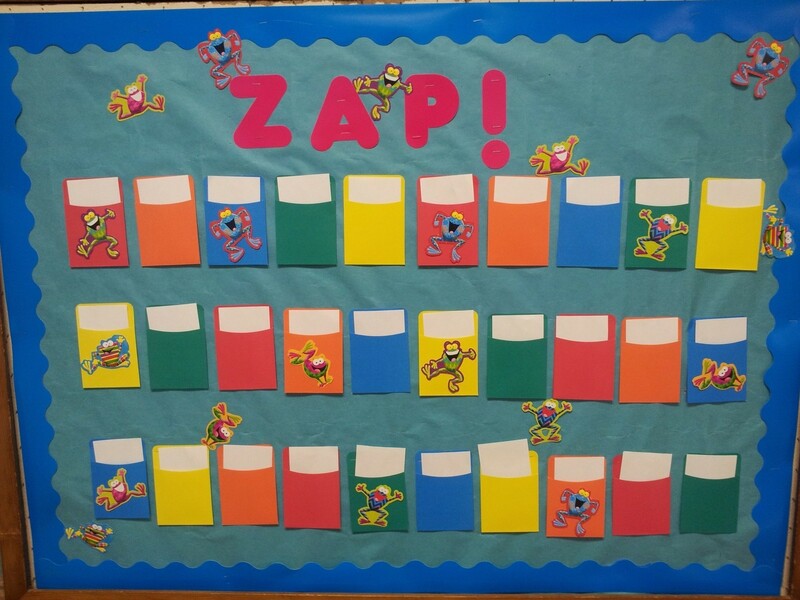 One of the BEST classroom review games I found was ZAP! Some of you are scratching your heads over this, so allow me to explain what ZAP! is. First, you make a board. This board is going to hold all your envelopes and cards. Make it purdy and inviting! I have plans to decorate mine in the VERY near future. Staple or adhere the envelopes to the board. Once you’ve done that, sit down at your desk and start writing the cards out. 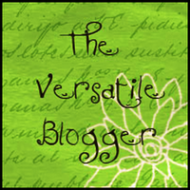 The original post (she’s full of fantastic ideas!) I got the idea from uses only 16 cards. That’s great and all – unless you’ve turned your kids into ZAP!-a-holics. My kids love-love-LOVE reviewing using the ZAP! game. They beg me all day long to play! I usually give in around History hour. 🙂 Anyway, I decided to make the game longer (this way I can review more questions to them – I’m sneaky like that). Now that you’ve gotten your cards written (I have ideas below to help you), you can load them all into the envelopes. Make sure you can’t see the words through the envelopes! I turn the cards around just in case. Divide the class into two teams. Have them make up their team names. Once they’ve done that, ask Team Rainbow Quadri-Dolphins (yes, that was a team name) a question. If they get it right, they get a point, and they get to pick a card. They have to follow what the cards says. Sometimes it’s in their favor, and sometimes it’s NOT. It’s the next team’s turn at that point. Whoever has the most points when all the cards are gone is the wiener. I mean, winner. Here are what my cards say. You’re welcome to change your ZAP! game around to however you like! 2. Add two points to your team’s score. 6. The other team jumps up and down while answering the next question. 9. The other team walks around like chickens on the next question. 11. The other team spins around while answering the next question. 12. Give 1 point to the other team. 13. Add 10 points to the other team’s score. 14. The other team sings their answer on the next question. 15. The other team dances around like ballerinas for the next question. 16. Add 10 points to your team’s score. 17. The other team does sit-ups while answering the next question. 18. The other team breakdances while answering the next question. 20. The other team must answer the next question ninja-style. For those of you needing library card pockets, you can buy them from your local teacher’s supply shop. If you don’t live near a teacher’s supply shop, Amazon.com has a boat-load for you to choose from. If you’re feeling REALLY crafty, and have way too much time on your hands, you can click this link for a free printable template, of which you can use to make your own pockets.